The Bill of Rights: Good, Bad, or Indifferent? I brought up this topic months ago and had the opportunity to lead a discussion about it at the Arizona chapter of the Republican Jewish Coalition. Please join the conversation in the comments sections below. Some Anti-Federalists opposed the Constitution even after a bill of rights was promised. For them, a bill of rights was just a way to oppose ratification. The Articles of Confederation had no bill of rights. Four state constitutions, including that of New York, lacked bills of rights even though the states had been acting as independent republics for years. There are many who think such addition unnecessary, and not a few who think it misplaced in such a Constitution… My own opinion has always been in favor of a bill of rights… At the same time I have never thought the omission a material defect… I have not viewed it in an important light. because I conceive that in a certain degree… the rights in question are reserved by the manner in which the federal powers are granted. because there is great reason to fear that a positive declaration of some of the most essential rights could not be obtained in the requisite latitude. I am sure that the rights of conscience in particular, if submitted to public definition, would be narrowed much more than they are ever likely to be by an assumed power. because the limited powers of the federal Government and the jealousy of the subordinate Governments, afford a security which has not existed in the case of the State Governments, and exists in no other. because experience proves the inefficiency of a bill of rights on those occasions when its controul is most needed. Repeated violations of these parchment barriers have been committed by overbearing majorities in every State… Wherever the real power in a government lies, there is the danger of oppression. In our Governments the real power lies in the majority of the Community, and the invasion of private rights is chiefly to be apprehended, not from acts of Government contrary to the sense of its constituents, but from acts in which the Government is the mere instrument of the major number of the Constituents. It has been objected also against a bill of rights, that, by enumerating particular exceptions to the grant of power, it would disparage those rights which were not placed in that enumeration; and it might follow by implication, that those rights which were not singled out, were intended to be assigned into the hands of the General Government, and were consequently insecure. This is one of the most plausible arguments I have ever heard urged against the admission of a bill of rights into this system; but, I conceive, that it may be guarded against. I have attempted it. Did Madison succeed with the Ninth Amendment? Were the arguments against a bill of rights valid then? Have our rights been effected positively, negatively, or not at all by the Bill of Rights? Should we focus the debate on protecting our individual rights or on limiting the government’s powers? 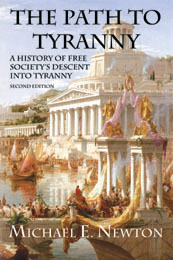 I picked up Angry Mobs and Founding Fathers as I had read Michael Newton’s previous book The Path to Tyranny: A History of Free Society’s Descent into Tyranny and really enjoyed it. His new book lives up to the same quality as the previous one and I would highly recommend both to anybody. The book covers the social side of the American revolution and covered aspects of the whole thing that I was largely unaware of. The American revolution is often compared to the French revolution, with the American revolution being seen as the thinking mans revolution and the French revolution as the revolution of the mob. It was fascinating to see how close the grand American experiment came to becoming just another “also ran” mob based revolution and how the genius of the founding fathers prevented it descending into one. I can’t recommend this book highly enough as a behind the scenes look at a time in history that came perilously close to going off the rails. Michael E. Newton has done it again. Angry Mobs and Founding Fathers: The Fight for Control of the American Revolution is chock full of interesting facts, startling patterns, and answers to questions that were never raised in my social studies classes. Who knew that all of the colonists weren’t English? How could I have studied the revolution and never heard the name Apollos Rivoire? Of course western expansion needed the railroads to be developed first. Why didn’t anybody ever tell me that before? If today’s Tea Party, by virtue of its very name, is a throwback to the angry mobs of yesteryear, who are the people who will step up to be our new founding fathers? The angry mobs brought us a revolution. The founding fathers developed the miracle of our Constitution, to prevent that revolution from descending into chaos, anarchy and tyranny. 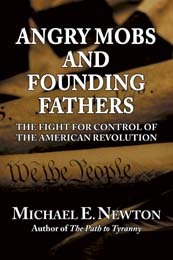 Michael E. Newton presents the American revolution and the twists and turns of the first decades of our country in a book that is readable and enjoyable, one that I wish I could have read years ago. The Path to Tyranny is a lucid and compelling treatment of an important subject, one that should be of interest to all who value liberty… An important book that really does speak to the times, a book that holds up a Janus-like mirror to the present, showing past futures. This book was disturbingly amazing in its review of historical events. It is well cited and developed and even though the author writes from his own political perspective not even the most hardened leftist could argue the historical data presented in this book. That by itself is the most disturbing aspect of it. I can only hope that more and more Americans read this book and discover the path we are truly teetering on. Michael E. Newton’s THE PATH TO TYRANNY is a compressed and incredibly well-written and researched book. Let me warn you: it is more frightening than a Stephen King novel. Mr. Newton analyzes ancient and recent societies, explaining how they came about, how they prospered, and how they descended into totalitarianism and disappeared. Newton’s account of the rise and fall of the Roman Empire alone is worth the price of admission. The amount of facts and history he crams into the chapter is impressive. Same goes for Russia’s wild ride from absolute monarchs through revolution then communism, and Germany’s path from defeat in WWI through hyperinflation and the hapless Weimar Republic to Adolf Hitler. By far the scariest, though, is Chapter 8: The United States of America. The parallels Newton draws from previous civilizations descending into oppressive autocracies to the path of the present day U.S. is frightening. Before they cratered, all the societies followed the same pattern: villification of the successful and redistribution of wealth through progressive taxation; expansion of government and bureaucracy; the rise of an exalted political class; promotion of pure democracy over the principles of a republic; the emergence of one person, a dictator or tyrant who crushes freedom and liberty with the promise to return the crumbling society to its former glory. Mr. Newton’s succinct final chapter about the U.S. includes a sub-chapter about the complexity of federal laws, which now include over 4,000 crimes defined and buried deep in the federal register, unknown to anyone until nabbed by a federal toady who cries “gotcha.” The sub-chapter is entitled “We Are All Criminals Now.” Bravo Michael E. Newton. Please tell us more. Everybody knows that New York City is a major center of liberal ideology. A number of New Yorkers decided to remind Glenn Beck of that fact a few weeks back. But while the residents of New York think liberal, they often act libertarian. Just go to any Manhattan street corner. The government in its wisdom and kindness has install lights that tell the people of New York whether they are to WALK or DON’T WALK. Clearly, any liberal would tell you that such signs are necessary to create order and protect pedestrians from oncoming traffic. But reality is very different. As half those signs glow DON’T WALK, dozens of people are crossing against the government’s advice. The people of New York realize that they don’t the government to tell them when to cross. They can just look for themselves, see if a car is coming, and decide for themselves. People don’t need the government to organize every aspect of their lives. In the movie Keeping the Faith, the two main characters are waiting at a corner for a traffic light. The scene, meant to be a metaphor about life and faith, could also be a metaphor about politics and government. What the– Why are you standing here? Oh, my God. You’re right. What am I doing? What am I doing standing here? – Oh, my God. – This is New York City. Who waits for a sign? What– Cross the damn street! What, do we all need signs to tell us what to do now? God does not always give us a sign what to do. We certainly don’t always need signs from the government. — Michael E. Newton is the author of the highly acclaimed The Path to Tyranny: A History of Free Society’s Descent into Tyranny. His newest book, Angry Mobs and Founding Fathers: The Fight for Control of the American Revolution, was released by Eleftheria Publishing in July.